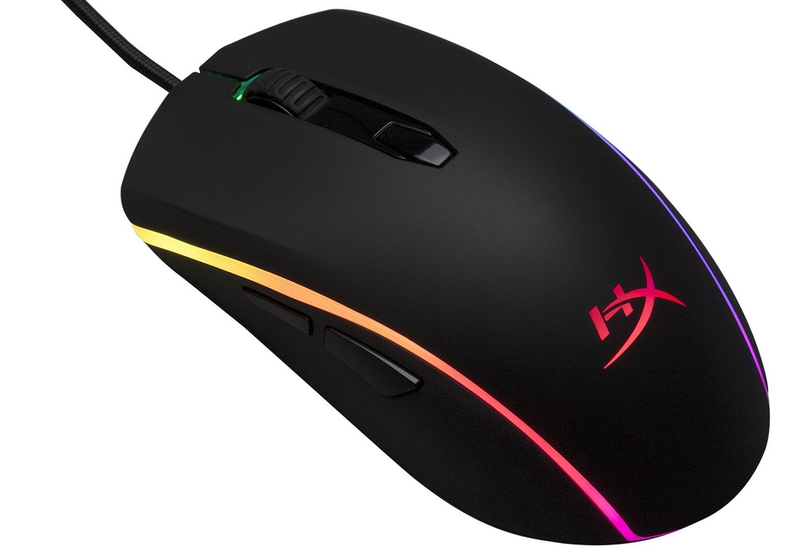 Gadget review by Nick H.
Kingston continues to knock it out of the park with its HyperX brand gaming peripherals, the latest of which is their incredibly stylish yet practical HyperX Pulsefire Surge mouse. This is a very well-built mouse, that responds with precision while gaming, but also has a sturdy look and feel to it that should bode well for a lot of clicking and movement over the coming months and years. The HyperX Pulsefire Surge is a fantastic blend of style and substance. 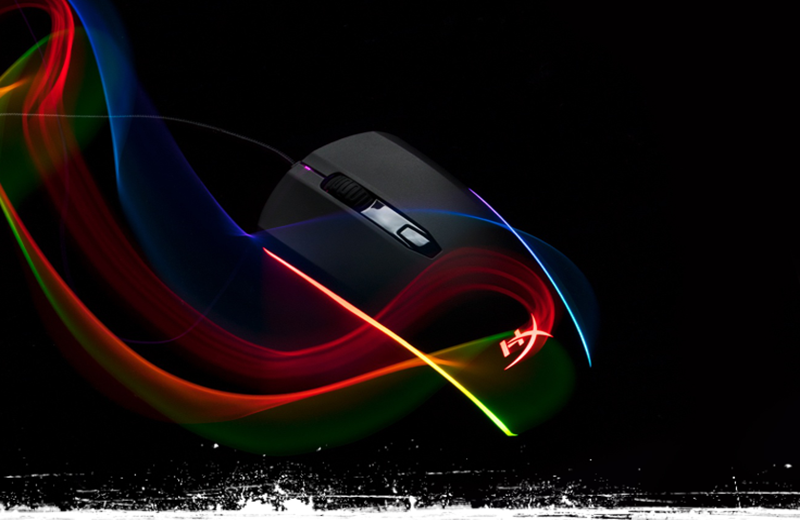 Visually this is a striking mouse, primarily due to the band of lighting around the perimeter. It is not unusual to see a mouse that has a backlit insignia near where your palm rests, or to have some glow coming up from around the scroll wheel (which is frankly something of a sloppy-looking effect in my opinion). Instead here we have a single band of backlighting that follows the contours of the mouse all of the way around. There are four levels of brightness to choose from, which is nice as I found the brightest setting to be a bit much in my usually dark office. This band of light is especially prominent against the dark colour used for the rest of the mouse. The backlight effect is one of several things that are highly customisable by using the software supplied with the device. This software is quick to install and intuitive to use - enhancing the experience instead of getting in the way, as well-made software should be. As for the mouse itself, the rubbery finish along the sides has a pleasant tactile feeling to it regardless of what method you hold your mouse. There is a sleekness to the design that has exactly what one would expect: right and left clicks on a smooth, slanted slope, a DPI switch, the scroll wheel and forward and back buttons along the side. I tend not to worry about mouse weight very often - after all the mouse is on a flat surface that supports the weight, unlike a controller. Still, there are no weight adjustment options with the HyperX Pulsefire Surge for those who like a lighter or heftier feel. It is worth noting that the HyperX Pulsefire Surge first rolled out earlier in the year, but there were concerns about how buttons 1 and 2 could potentially hit one another if depressed in just the right way. Kudos to Kingston for reading this feedback and making sure to re-release this mouse later to resolve this issue. Beyond that resolved concern, the mouse itself probably qualifies as an average or medium sized one that should fit most hands and is capped off with a very nice braided USB cable. If you have happened upon any of my prior hardware reviews, you know that I am a bit of a sucker for a nicely braided cable and this one is right up there. The only potential quibble here is that the 'back' button along the side of the mouse is a bit further back and might not be as comfortable of a reach as smaller ones located closer together. Additionally, some mice feel the need to provide even more buttons, but I honestly operate off of this number just fine so it was not a concern of mine. As for the actual performance, there is a lot to like here. You can use the aforementioned DPI button to really slide between quite a range (the defaults are 800 / 1,600 / 3,200 but you can ramp this thing up to a ridiculous 16,000 DPI if you are so inclined. There is onboard memory that supports up to three separate profiles. This is great for those who like to assign specific actions to certain buttons on the mouse through the software, or a particular lighting colour or pattern. The actual mouse tracking is fantastic, even with the DPI jacked up to ridiculous levels. 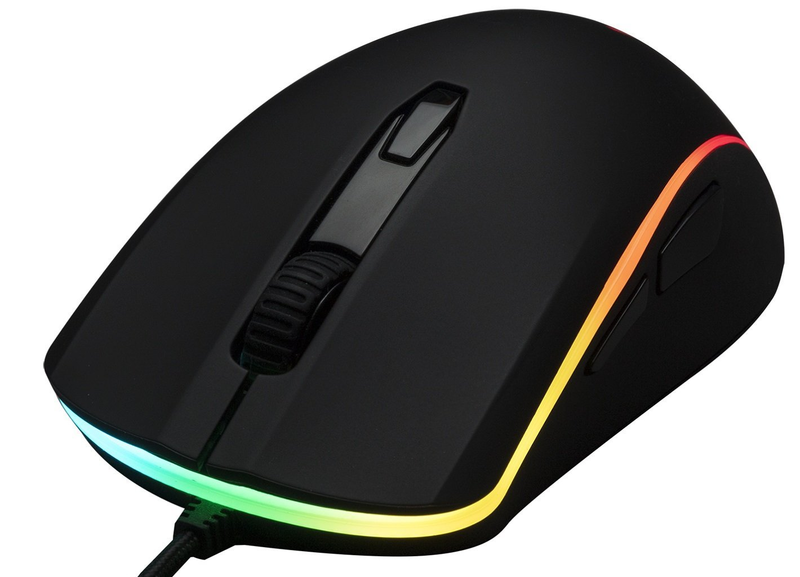 I tried this mouse on a variety of surfaces, and it was not pixel skipping unless I had the DPI all of the way up and I was flinging the mouse back and forth unrealistically. Even better than the actual tracking is how responsive the buttons feel. Getting the top two buttons right is not too hard, and thankfully the HyperX Pulsefire Surge is just as responsive and tactile as I wanted from a left and right mouse click. However, the scroll wheel has a satisfying popping movement without getting stuck (something I have seen in other mice previously) while the two side buttons respond with a clicky precision that simply feels great. I might not be completely in love with the back button's placement, but the design is smart, with the perfect profile to make certain that buttons are not being hit by accident, and they just feel right when they are used. There is a sturdiness to the HyperX Pulsefire Surge that likely comes from several factors. The braided 2.0 USB cable is always a great place to start, and the top shell is all one solid piece that leads into the left and right buttons. The two side buttons are long, with a nicely tapered feel to them that stands out when compared to some of the nubby, tiny rubbery buttons I have felt on other mice in the past. Even the scroll wheel with its thick ridge design rotates easily and gives the impression that it will hold up for a long time. At $70, the HyperX Pulsefire Surge comfortably falls into the middle of the pack in terms of price, but provides a quality of much greater value. This is one of the best looking and best performing mice I have used to date and absolutely deserves consideration if its price falls into the range you are looking to spend.